Something very interesting is happening to Irish consumer confidence right now. 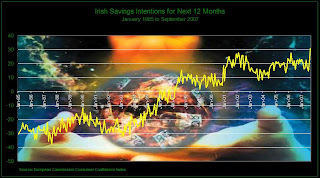 The chart shows the trend in the balance of 'intentions to save over the next 12 months' asked in a monthly survey of Irish consumers since January 1985. Over the course of twenty years, the balance of consumer savings intentions has switched from negative (more were planning to reduce savings than increase savings) to positive (more are planning to increase savings than reduce savings). Despite our credit/debt binge over the past decade, as far as consumers in general are concerned they have become net savers, not borrowers. More interesting still - the savings intention index for last month (September 2007) jumped to its highest level since the survey began back in 1985. The ESRI are currently forecasting a modest jump in the national savings ratio next year from just under 6% of disposable incomes this year to just over 6% in 2008. 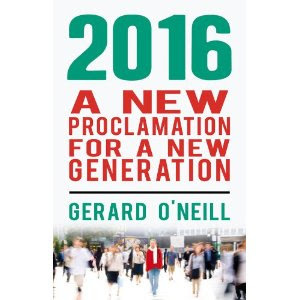 Perhaps we are in for something more dramatic if consumer intentions are our guide? Marketers in the financial sector could well see a surge in demand for savings and investment products over the coming months and right through to 2008. Others, however, should note that a higher savings ratio than forecast will cause consumer spending growth to fall back much more sharply: think low single digit growth and plan accordingly.